There is no doubt that online business has moved to different verticals, and customers prefer diverse types of the online shopping experience. Subscription is one of them. There are various advantages of implementing subscriptions on your eCommerce store. For instance, from a business point of view, you can turn a single purchase into a guaranteed monthly (or as per your requirement) recurring revenues. This will also help you to project Customer Lifetime Value (CLV), which will eventually assist you in building a stronger relationship with your customers. Also read, why you should use a Subscription business model. … One of the biggest advantage of subscription eCommerce is acquiring a transaction, (which) means, you acquire a customer over the longer term, rather than just that single one-off purchase. From a customer’s perspective, subscriptions can benefit those with a small budget, to access enterprise software or products. This will also give them the flexibility to stop a service at any time, and there are a lot of other advantages based on different subscription business models. As a matter of fact, one of the major concerns while implementing WooCommerce subscriptions service is finding a payment gateway that syncs suitably with your WooCommerce store. But, don’t be distressed! Our WooCommerce Stripe payment gateway plugin works perfectly fine with WooCommerce subscription service. This article intends to show you how our Stripe Payment Gateway Plugin for WooCommerce works with WooCommerce subscription service. Refer the Stripe product page to know more about other various features of the plugin. How to achieve WooCommerce Stripe Subscriptions? Consider you have a WooCommerce store where you sell a monthly digest. Now, let us create a monthly subscription service for the digest. For this demonstration, we will use the WooCommerce Subscription plugin. The first step is to install a subscription plugin. 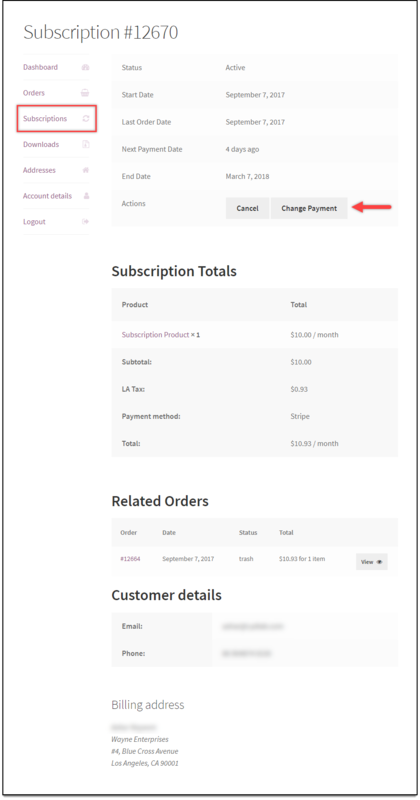 In our demonstration, the WooCommerce Subscription plugin. Purchase and install the plugin on your WooCommerce store. Refer to the product page for more information on the product. A sample screenshot of the plugin settings is shown below. Once the plugin is installed, we should add a new subscription product. Move to Dashboard > Products > Add new section. Enter the product name, product description, and other related details. Next, in the Product Data meta box, select your desired product type. 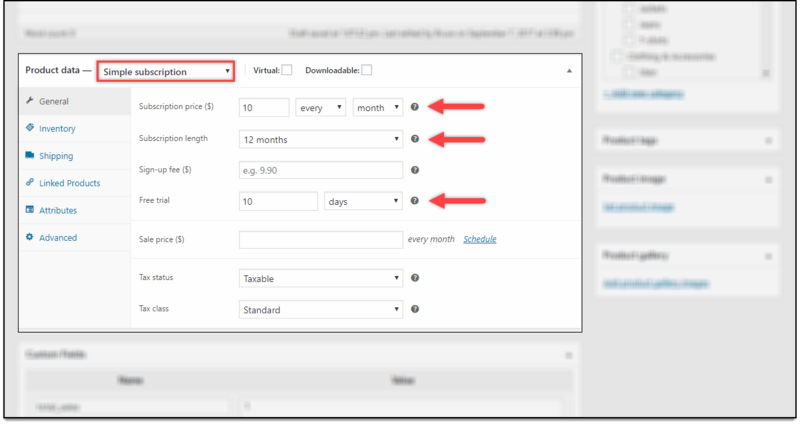 This setting is the most important setting for creating a subscription product. 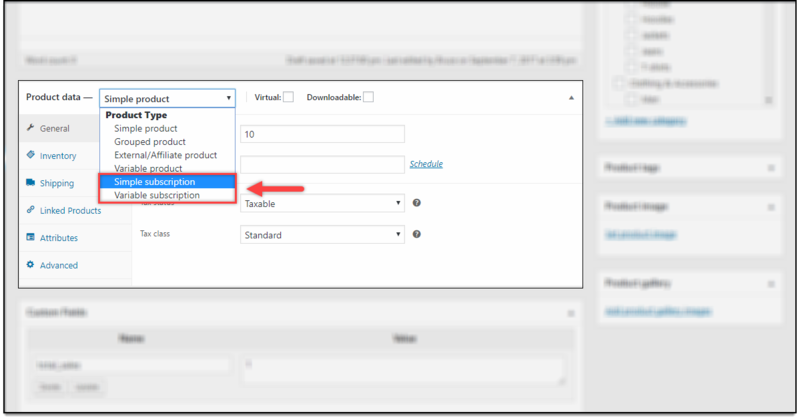 In addition to the default product types, you can find two types of subscription products: Simple subscription and Variable subscription. A sample screenshot is as shown below. For our monthly digest, we can select Simple subscription type. Further settings appear as shown in the screenshot below. Let us set a subscription price of $10/month for a year, offer a free trial period of 10 days. Enter other details of the product and publish it. With our WooCommerce Stripe plugin, you can accept credit cards, Bitcoins, Alipay and Apple Pay payments on your WooCommerce store. You can capture payments, and perform full/partial refunds as well. Check out the complete list of features on its product page. Once you have purchased and installed our WooCommerce Stripe plugin, read the product setting up article to understand the functionality of each feature of the plugin, and to configure it. It’s time to purchase the product. For this, let us move to the front-end of our WooCommerce store. A sample screenshot of the product page is shown below. Moving to checkout page for purchasing the product. A screenshot of the checkout page is shown below. Next, click on Pay via Stripe button to proceed with the payment. Next, in the Stripe checkout form, enter the payment credentials, say credit card information to complete the payment transaction. Go to WooCommerce > Subscriptions to view all subscription orders. Each subscription is indicated by the current status (ACTIVE – for successful payment/PENDING – for unsuccessful payments/ON HOLD – for pending manual payments), subscription number, total amount, start date, end date trial end, next payment and so on. In the same way, you can suspend or cancel the subscription as well. A sample screenshot of the Subscriptions page is as shown below. 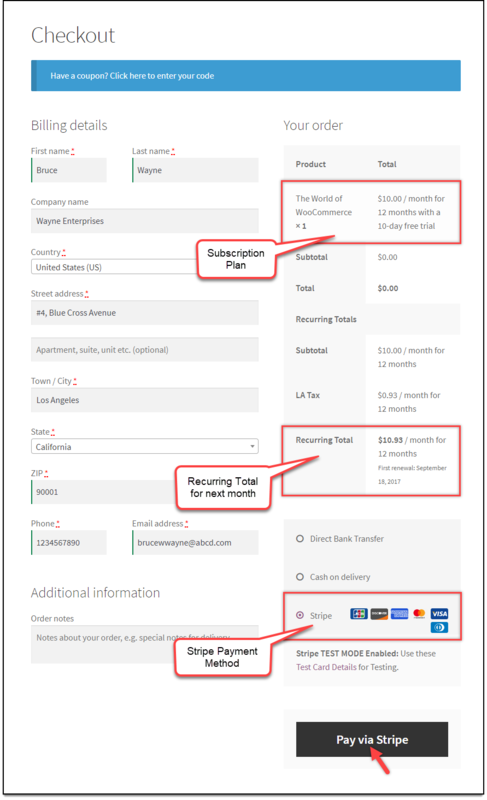 A separate section titled Subscriptions is created for customers to view all their subscriptions, in their My Account page. 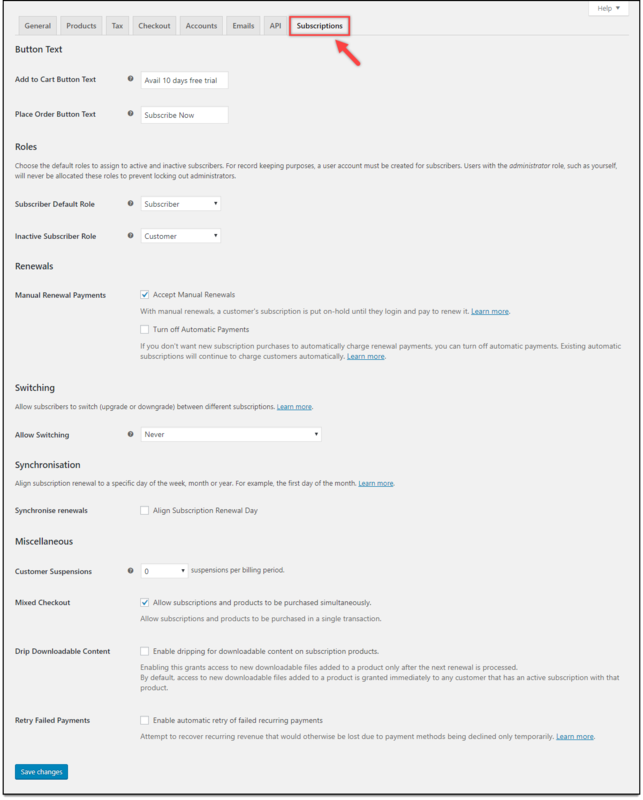 If you have turned off automatic payments under Manual Renewal Payments option in WooCommerce Subscription plugin settings, your customers can change the payment method from the subscription page. Read more about the subscription renewal process here. A sample screenshot of a subscription order is shown below. Click on Change Payment to change the payment method. You can select from the available payment method, and proceed with the payment. 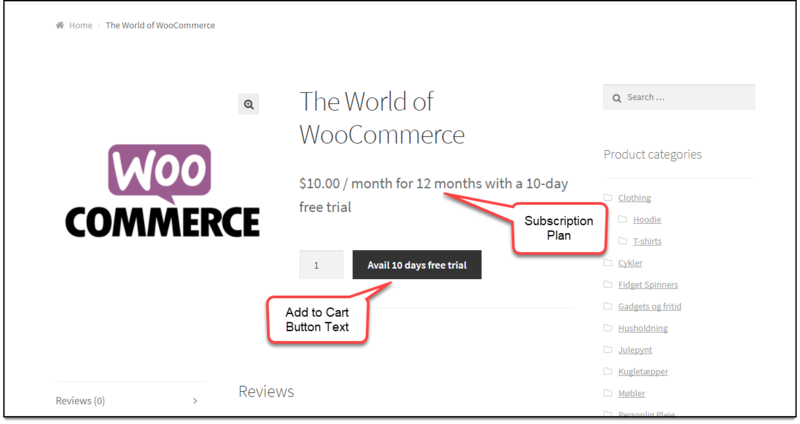 Therefore, in this way, you can achieve WooCommerce stripe subscription for your WooCommerce store.